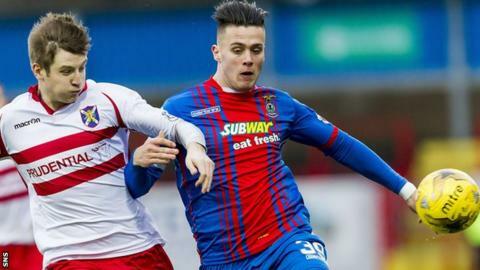 Scottish Cup holders Inverness Caledonian Thistle were taken to a replay in the fourth round of this season's tournament by Stirling Albion. Danny Williams forced a save from Stirling goalkeeper Chris Smith in an otherwise quiet first half. The visitors were more forceful after the break but still could not break down their League Two opponents. And Albion almost snatched a famous win over the Premiership side with Craig Beattie going close late on. The two teams will meet again at the Caledonian Stadium on 19 January. After Williams had been denied by Smith in the first half, Miles Storey, David Raven and Danny Devine all threatened for the Highlanders in the second period. However, the gallant Stirling defence stood firm and repelled John Hughes' side. At the other end, keeper Owain Fon Williams was called upon to keep out an effort by Willie Robertson. And magnificent defending by Gary Warren kept substitute Beattie at bay. Match ends, Stirling Albion 0, Inverness CT 0. Second Half ends, Stirling Albion 0, Inverness CT 0. Attempt missed. Greg Tansey (Inverness CT) right footed shot from the centre of the box is close, but misses the top left corner. Substitution, Stirling Albion. Craig Beattie replaces Craig Comrie. Corner, Stirling Albion. Conceded by Liam Polworth. Attempt saved. Willie Robertson (Stirling Albion) right footed shot from the right side of the box is saved in the bottom left corner. Attempt saved. Alex Fisher (Inverness CT) right footed shot from the centre of the box is saved in the bottom right corner. Substitution, Stirling Albion. Mark Lamont replaces Philip Johnston. Danny Williams (Inverness CT) wins a free kick in the attacking half. Corner, Inverness CT. Conceded by Ross McGeachie. Corner, Inverness CT. Conceded by Darren L. Smith. Attempt missed. Danny Williams (Inverness CT) left footed shot from outside the box is close, but misses to the left. Attempt missed. Alex Fisher (Inverness CT) right footed shot from very close range is close, but misses to the left. Attempt missed. Darren L. Smith (Stirling Albion) right footed shot from the centre of the box is just a bit too high. Second Half begins Stirling Albion 0, Inverness CT 0. Substitution, Inverness CT. Alex Fisher replaces Nathaniel Wedderburn. First Half ends, Stirling Albion 0, Inverness CT 0. Attempt missed. Danny Williams (Inverness CT) left footed shot from outside the box is high and wide to the left. Corner, Inverness CT. Conceded by Craig Comrie.